Angela Westwater. Portrait by Greg Kessler. In 1975, Angela Westwater’s first desk at the New York office of Sperone Westwater was a door laid across two filing cabinets. Today she sits behind an Art Deco-inspired table created by star architect Alan Wanzenberg. On a Monday in December, the gallery that she helped co-found with Gian Enzo Sperone and Konrad Fischer is empty, making it easy to admire the sleek interiors of the Norman Foster-designed high-rise on the Lower East Side. The building, like the desk, was made for Westwater and is only the second building the Pritzker Prize-winning architect has constructed in New York. It makes sense: blue chip dealer, blue chip roster, blue chip architects. Artforum office, July 1972. John Coplans, Angela Westwater, Tanya Neufeld. Courtesy Angela Westwater. Not long after taking her first gallery job, Westwater transitioned out and became the managing editor at the then fledgling Artforum. “It was an office of five people, so we kind of did everything. I was spell-check,” she says of the era. Westwater left publishing in 1975, but continued to play the role of editor. She linked up with Sperone and Fischer, whose impressive roster of European artists like Gilbert & George and Richard Long informed their gallery’s early programming. “At the time we started, there were very few places that regularly showed European art,” Westwater explains. “That was part of our original mission. Now, things have changed.” Flipping through the Sperone Westwater archives, one sees the strength of the overseas influence; the 1970s and 1980s read as a who’s who of Arte Povera, early Conceptualism and European Abstraction, from Joseph Beuys and Mario Merz to Cy Twombly and Gerhard Richter. 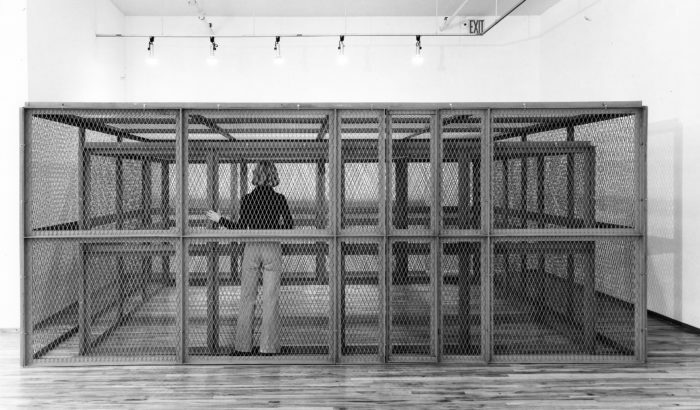 Angela Westwater inside Bruce Nauman’s Double Steel Cage Piece, 1974. Courtesy of subject. The one thing missing from Westwater’s early days as a dealer were other women. “We didn’t show enough,” she admits. A handful of shows by Louise Bourgeois and Brenda Miller were the exception to the rule. These days, females feature much more prominently. A painted stampede by Susan Rothenberg commands a wall in Westwater’s office. “It actually came straight from her studio,” Westwater says of the imposing canvas. “Susan always grew up looking up to Jasper Johns, and he had told her to always save some of her work. Aren’t we lucky she did!” In the 2000s, the gallery picked up Tom Sachs, Jonathan Lasker and Laurie Simmons, who added a new context to a program that continued to produce nostalgic fantasies with regularity. Angela Westwater is President of the Louis Comfort Tiffany Foundation.